The White House Chief of Staff – The Most Powerful Person in Washington? I’ve often thought that the role of the White House Chief of Staff (WHCOS) was equal in complexity and responsibilities to about any other public servant’s role that I could think of. If something goes right or wrong in the White House, you can generally credit or discredit the Chief of Staff. It’s a gritty position and the person who occupies it must be tough as nails but come across as the “Great Understander” as well. Decisions have to be made and procedures need to be enforced – that’s the job of the Chief of Staff. He or she also serves as the guard dog of the Oval Office. If someone wants to see the President, they need to convince the Chief of Staff they should – no, that they must. The role is relatively a modern one, coming into vogue after World War II. Presidents generally felt with the increasing complexity and scope of their role, someone was needed behind the scenes to be the number one planner, doer and enforcer in the White House. Inside the Executive Office of the President (EOP), the WHCOS manages the National Security Council staff, the Council of Economic Advisers, the Office of Management and Budget and several others. Prior White House service. My personal opinion is this experience is worth its weight in gold – even if it was during another administration or another party. The WHCOS must intuitively know which levers to pull, who to call, how things work in the White House to be fully effective. The WHCOS must know the functions of the White House players backwards and forwards. You can’t learn those things in any other way – they must come from experience. Prior or current beltway experience and sway. Again, even if your objective is to “drain the swamp”, a good WHCOS needs to have been produced from within that swamp. The person must have a bulging Rolodex and use speed and precision when determining who to call and when. That type of knowledge is more than just being a good business leader. My opinion is if an “outside president” brings in an “outside COS”, that person will not last too long. For example, Mack McLarty, Bill Clinton’s friend from Arkansas, didn’t last in the job too long – just over a year. Right personality. We don’t need any namby-pamby, I can’t make a decision right now types. On the other hand, perhaps the WHCOS doesn’t need to be the “Alexander Haig” type. Secretary of State Haig, a former four-star general, tried to reassure the nation after the 1981 assassination attempt on President Ronald Reagan by going to the White House, standing in the authoritative position, hands on hips, and stating, “For right now, I’m in charge at the White House.” Bottom line: the correct personality for this position is firm but fair, assertive but not forceful and relishes making things happen behind the scenes. The WHCOS should also have a great sense of humor. Multitasker. A good WHCOS has many actions to attend to all at once. The old “crystal ball in the air” analogy applies here. The WHCOS juggles many different balls in the air but if one drops, just hope it is not one of the crystal balls – those are sacrosanct and if one crashes the results could be devastating for the president. Loyalty and dedication to the president. The president usually selects a trusted confidant to serve as WHCOS anyway, but it is important that this person believes strongly in the president’s leadership, ethos and program. After all, the WHCOS is a key player who puts the president’s program in motion. Try to think of him as a switchboard operator – constantly connecting the right people and actions to get things done. He is the ultimate stage setter – getting the actors together at just the right moments and coaching them on their delivery. My belief: The WHCOS is not the most powerful person in Washington – that distinction is held by the president. The WHCOS is, however, sometimes influential in pushing the president’s political agenda and facilitating eventual legislation. Sometimes the WHCOS serves to shift political “heat” away from the president temporarily until the overall message can be clarified or refined. Occasionally this very important person is the quintessential internal White House organizer and manager. The WHCOS is therefore a very versatile public leader with an enviable leadership skill set. It’s up to you to decide if the incumbent is living up to the promise and potential of the job’s monumental 24/7 responsibility. If your answer is yes, wonderful. If your answer is no, then take heart anyway — it seems the shelf life of a WHCOS is generally one to two years in recent history. 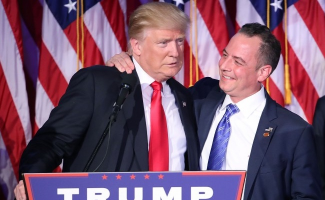 One Response to The White House Chief of Staff – The Most Powerful Person in Washington? What an insight into the less-discussed role of the WHCOS! I agree with the author on all points. We can all apply the above-referenced credentials to former, current, and future holders of this position and almost see where they excel or are lackin,g and the direct correlation to their effectiveness in relation to the President’s agenda. Thank you, Robert Brescia, for spelling out what it takes to be a successful chief of staff – to the President or otherwise.